Vehicle recalls happen all the time, and while this is nothing new, you need to make sure and stay on top of iv a vehicle recall has occurred on your own vehicle, or if you know someone who is driving a vehicle that has issued a recall. Recently, the 2014 Dodge Ram has been recalled. This is one of the best selling trucks on the market, but almost all Dodge Ram 2014 trucks, including the Ram 1500, 2500 and 3500 have been recalled so far. As the 2014 model vehicle is still rather early in its life span, around 11,000 of so vehicles are being recalled, so if you are driving one, you need to bring it into the dealer and have the situation corrected, free of charge. The problem with the 2014 Dodge Ram is the instrument-cluster lighting behind the display can go on and off in some trim packages. The federal government requires all information to be properly displayed and easy to read, no matter the condition or the time of day. Because of this, the lighting is a problem and needs to be corrected. In order to fix the situation, Chrysler Group needs to simply go into the computer programming of the vehicle and change the settings. This is done in a matter of a few minutes, so you shouldn’t have to take too much time out of your day in order to correct the problem. 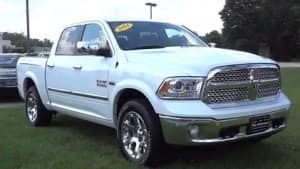 To correct the issue, simply take your 2014 Dodge Ram into the local Ram dealership (or other Chrysler dealerships, if you are not by a Ram offering, as any Dodge dealership should be able to correct the situation). The technicians will then update the cluster software inside of the vehicle to correct the problem, without a cost to you. Of course, this is an excellent time to have any other work done on the vehicle, should you desire, such as have the oil changed, while it is being services. However, if this is not needed, you can be back on the road in very little time. Chrysler Group is currently notifying all of its customers who have purchased the Ram that has been affected of the situation. Not all 2014 Dodge Ram trucks are affected, as other trim models and packages do not have any sort of problem. This is just something you need to look for in the mail in order to know for sure of if your vehicle requires the recall or not.